A Moscow dolphinarium, which offers therapy to children suffering from physical and mental disabilities, faces eviction from its current premises. ­Their building needs urgent repairs, but the center has nowhere else to go. Vanya, a timid six-year-old boy with a developmental disorder, and Casper, a vivacious Beluga whale with slightly asymmetrical fins, met a few months ago. Forty minutes in the pool, twice a week, and Vanya's mother can already see the difference. “I can see that he is opening up to the world. He has become more confident and more sociable and that happened without any drugs and side effects,” says Vanya’s mother, Yulia Zatvornova. 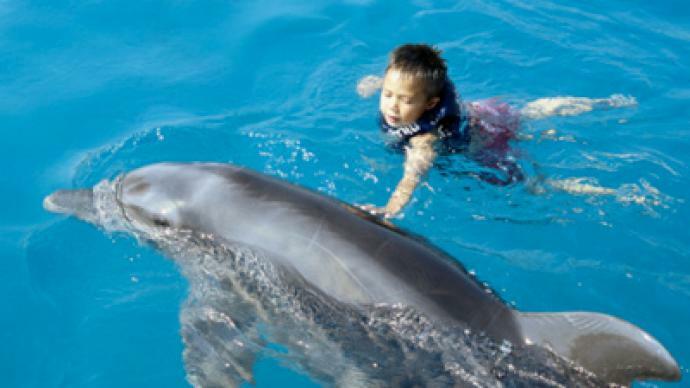 Vanya is one of several thousand children who have received dolphin therapy at the Moscow dolphinarium. That is until the city authorities ordered the dolphins and their trainers out of these pools, citing unpaid utility bills and crumbling infrastructure. “This building was not designed to handle large quantities of salt water. The salt has ravaged supporting structures and the building could collapse like a house of cards any moment,” explains engineer Aleksandr Motkin. The facility is indeed in need of repair. Yet, while asking the Dolphinarium to vacate the premises, City Hall, which owns it, is not offering any alternative accommodation. Eviction notes can make even humans feel like fish out of water. For these sea creatures, it is much more than just an uncomfortable situation. Some have been shipped to other aquariums; others are still waiting for their fate to be decided. “This is one of our last remaining artists. His name is Stepan. This is the first time in his life that he has the pool all to himself and it is very distressing because dolphins and whales are very social animals. We do not know what to do with him now. So far the only option is to take him home, but he’s too big for a tube,” says Natalia Voldiner from the Moscow Dolphinarium. Legally speaking, City Hall has every right to evict the dolphinarium. And it looks like it is going to, with little regard for the animals or the children they have been helping. One of the reasons dolphins are so good with children is that they are eager to please. They are attuned to their little patients' needs and limitations. They are gentle, well-intentioned and accommodating. Exhibiting all the qualities that people would look for in everybody involved in this dolphin eviction scandal, but so far failing to find. It is capitalism after all. The one who stays is the one who pays. And children's therapy is not the most profitable business for this prime location, no matter how valuable it is. “Doctors are still skeptical about how effective this treatment is, but any mother of a child with autism or cerebral palsy who’s tried this therapy would tell you that it works. Every little improvement is huge for us. That is why we can’t stand to lose the dolphinarium,” says therapist Valida Matyakubova. But these arguments are so far being drowned out in a city that styles itself as more suitable for sharks than for dolphins.